Chemours (formerly DuPont) is the manufacturer of Teflon® (Poly Tetra Fluoro Ethylene) Industrial coatings. With a unique combination of properties, Teflon® Industrial coatings have gained acceptance in a wide range of applications. 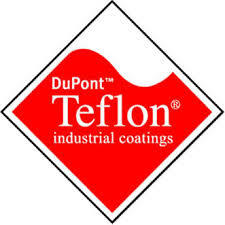 Teflon® Industrial coatings spray on like paint and bake to a tough, inert finish. Over the years, DuPont technology has extended the family of Teflon® coatings to ensure a finish with the ideal combination of properties to meet most design needs. By combining heat resistance with almost total chemical inertness, excellent dielectric stability and a low coefficient of friction, Teflon® Industrial coatings offer a balance of properties unbeatable by any other material. It's the original non-stick finish. TeflonT industrial coatings can be used on carbon steel, aluminum, stainless steel, steel alloys, brass, and magnesium, as well as non-metallics such as glass, fiberglass, some rubber, and plastics. Optimum adhesion is obtained by roughening the surface before applying the coating. Except where specifically mentioned, most TeflonT coatings for industrial use require a primer coat. Thanks to a variety of coating types, the unique properties of TeflonT industrial coatings can become an integral surface component on any kind of part - from clutches that engage easier and valves that resist wear, to coil springs that become silent. With proper equipment, TeflonT industrial coatings can even be applied to specific areas of complex geometric parts, such as the internal threads of a nut. Very few solid substances will permanently adhere to a TeflonT finish. Although tacky materials may show some adhesion, almost all substances release easily. The coefficient of friction of TeflonT coatings is generally in the range of 0.05 to 0.20, depending on the load, sliding speed, and the particular TeflonT coating used. Since surfaces coated with TeflonT are both oleophobic and hydrophobic, they are not readily wetted. Cleanup is easier and more thorough - in many cases, surfaces are self-cleaning. TeflonT industrial coatings can operate continuously at temperatures up to 260°C/500°F..
Over a wide range of frequencies, TeflonT coatings have high dielectric strength, low dissipation factor, and very high surface resistivity. By special techniques, it can even be made electroconductive enough to be used as an anti-static coating. Many TeflonT industrial coatings withstand severe temperature extremes without loss of physical properties. TeflonT industrial coatings may used at temperatures as low as -270°C/-454°F. TeflonT coatings are normally unaffected by chemical environments. The only chemicals known to affect all TeflonT industrial coatings are molten alkali metals and highly reactive fluorinating agents.